Introduction: Treatment of T1N0M0 (T1 = greatest tumor size < 2cm, N0 = regional lymph nodes not palpable by clinical examination, M0 = No evidence of distant metastasis) (Green FL, Page DL, Fleming ID, Fritz AG, Balch CM, Haller DG, Morrow M. AJCC Cancer Staging Manual. New York: Springer; 2002) lesions of hard palate carcinoma by radiotherapy carries equal results with the advantage of cosmesis and can avoid surgical complications. External beam radiotherapy (EBRT) will last for 6–8 weeks. 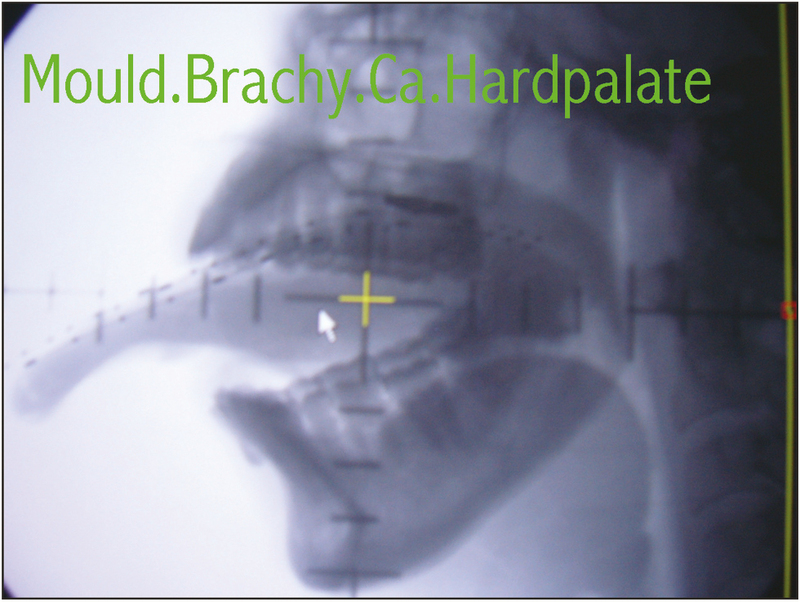 Feasibility of high-dose-rate (HDR) intraoral mold brachytherapy is an alternative to EBRT, which is highly effective and reduces treatment time and is also cost-effective one, which can be practiced in a center without Linac facilities. Materials and Methods: Custom-made surface molds were prepared for each patient with dental wax, and HDR after loading tubes were placed as per tumor volume. After simulation, with the help of simulation check films, treatment was planned with PLATO Treatment Planning System (TPS) and optimization was carried out. 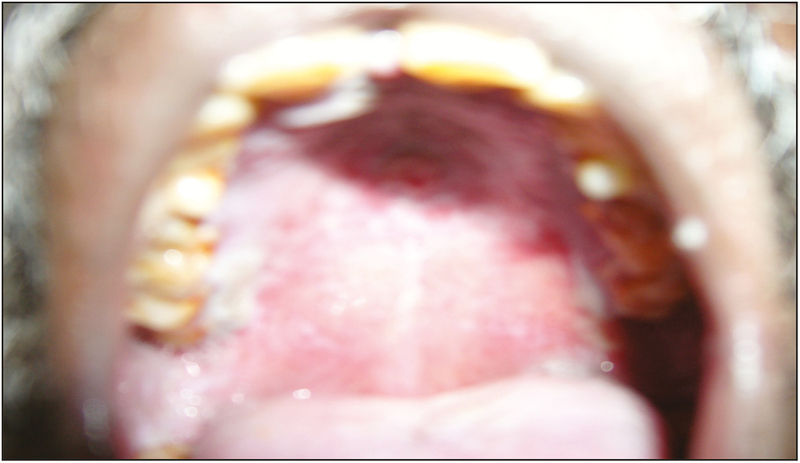 Results: We treated six cases of T1N0M0 hard palate carcinoma by HDR intraoral mold brachytherapy. A total dose of 42–45 Gy in 14–15 fractions with 3 Gy per fraction, two fractions per day with a gap of minimum 6h was administered between two fractions. (Gray [Gy] is the unit of absorbed dose of radiation by tissues. A total radiation dose of 42–45 Gy will be delivered as per radiobiological principles, in divided number of fractions, thereby the given dose of radiation will kill the major portion of the tumor cells, which were in various sensitive phases of cell cycle and at the same time, less damage to the normal tissues. The time between two fractions of radiation is 6h, which is the experimentally proven optimal time for recovery of normal tissues from radiation damage and tumor tissues to enter into the sensitive phases of the cell cycle to radiation damage-late G2 and S phases). There was confluent mucositis and all the patients had a complete response and none of the patients had relapse. Conclusion: Early (T1N0M0) lesions of hard palate carcinoma with HDR intraoral mold brachytherapy will shorten overall duration of treatment time with excellent local control and toxicities as compared with EBRT. Treatment of skin cancers, cancers of oral cavity, oropharynx, and palate region by surface mold brachytherapy is a well-described technique in radiotherapy. The surface mold brachytherapy can be used alone.,, At MNJ Institute of Oncology and Regional Cancer Center, Red Hills, Hyderabad, Telangana, India, a total number of 7500 new cases are registered per year. Of which, 20% of cases are of head and neck region and majority (90%) of cases are in advanced stage at presentation. Early carcinomas of hard palate (Stage I) region account for less than 0.5% of early stages of head and neck cancers (10%) and rarely metastasize to regional lymph nodes. Carcinomas of hard palate region account for less than 0.5% of head and neck region in MNJ Institute of Oncology and Regional Cancer Center. These tumors are easily accessible to vision, thereby to early diagnosis and treatment. External beam radiotherapy (EBRT) gives excellent results but it carries a longer duration of treatment. Surface mold brachytherapy is a practical mode of treatment and a good alternative to EBRT to the patients, where we can avoid multiple visits and prolonged duration of overall treatment duration. This is a practical way of treatment in centers where appropriate EBRT energies for treatment were not available. Superficial cancers were reacted by Iridium (Ir)-192 interstitial brachytherapy, or with mold brachytherapy with gamma ray emitters. Nowadays, the present HDR brachytherapy machine uses a source, usually Ir-192, with few millimeters length and <1mm diameter and with high activity. 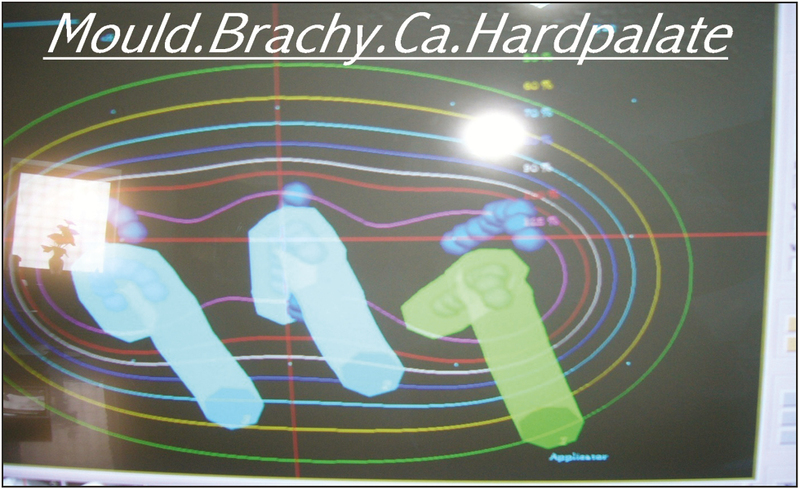 High-dose-rate (HDR) brachytherapy equipment were accompanied by Treatment Planning System (TPS), calculation of dose distribution, and optimization for individual cases,,, thereby quality assurance and precision planning. In this article, we describe a custom-made low-cost HDR brachytherapy treatment technique useful in the treatment of six cases of hard palate carcinoma (T1N0M0). We treated total six patients with T1 lesions of hard palate carcinoma between 2004 and 2009 at MNJ Institute of Oncology and Regional Cancer Center. The patients with histopathologically proven hard palate carcinoma were selected. After clinical examination, those having T1 lesions (as per tumor node metastasis staging system) without palpable neck nodes were included for protocol treatment. Contrast enhanced computed tomography (CECT) head and neck was carried out to exclude bone and paranasal sinus and lymph nodal involvement. Baseline blood investigations and chest X-Ray was carried out. After pre-radiotherapy dental prophylaxis and extractions, individual’s hard palate impression was prepared with dental molding material for each patient. Tumor was traced on the mold. HDR source catheters were placed 0.8–1cm apart based on the tumor size and with treatment, margin in the grooves was made manually and the flexible interstitial brachytherapy catheters were fixed in the grooves, which were parallel to each other. Before and after placing the catheters, dummy source checks were carried out to know the patency of the catheters. Dental mold with catheters was covered with dental wax to reduce discomfort to the patient. There is a problem with incisor teeth and anterior palate, causing some areas of irregularity of the arch of the surface, leading to smaller diameter tubes so as to pass the source to pass through the tubes. This will lead to a gap between channels and surface of the molds. The patients were simulated with intraoral wax mold and with dummy sources. The target volume was defined. Treatment planning and optimization were carried out with PLATO TPS. The patients were treated with a total dose of 42–45 Gy/14–15 fractions, with 3 Gy per fractions with two fractions per day with a minimum interval between two fractions being 6h. The severity of oral mucosal reactions was recorded during treatment and after completion of treatment. During radiotherapy, patients were kept on mouth gargles and prophylactic oral antifungal. During treatment, patients who were experiencing pain because of mucosal reactions were given Xylocaine spray 5–10min before placing mold. The minimum follow-up period was 2 years and maximum follow-up period was 5 years [Figure 1], [Figure 2], [Figure 3], [Figure 4], [Figure 5], [Figure 6]. A total of six patients were studied, age of these patients ranged between 50 and 70 years. All of them had T1 lesions as per the inclusion criteria. One patient each had squamous cell carcinoma with histopathological grade 2 lesion and grade 3 lesion, whereas the remaining four patients had grade 1 lesion. These patients were followed up for 3–5 years and complete remission was seen in all the cases. All the patients received the radiation dose of 3 Gy per fraction with two fractions per day with minimum 6h interval for 14–15 fractions over 10–14 days. None of the patients had a recurrence during the follow-up period. We produced an acceptable plan for all the six patients. The variation in the surface of lesions and the variation in implant distance lead to generate a plan, which delivers a uniform dose to the whole area. Early cancers of the oral cavity can be effectively managed with surgery or radiation. Surgery will be in the form of wide local excision, leading to significant functional or cosmetic problems. Even it is very difficult to achieve negative margin. For early T1–2 oral cancers, combination of external beam radiation plus/minus brachytherapy boost usually in the form of interstitial brachytherapy had 74%–92% control rates.,, Sufficient evidence was available to prove that low-dose-rate (LDR) brachytherapy delivered higher doses of radiation for local control of oropharyngeal cancers and for limiting toxicity.,,, The local control and complication rates were similar with LDR and HDR brachytherapy., To minimize morbidity, moderate doses of EBRT and smaller doses of HDR brachytherapy are used to prevent the wide spread lymphatic involvement. In the present study of hard palate carcinoma with minimal lymph node involvement, HDR mold barchytherapy was used more effectively. In 2004, before initiating treatment, we communicated with Subir Nag, regarding evidence of using HDR brachytherapy as a sole modality for dosage schedule. In selected patients with early and superficial lesions, the use of surface mold applicators has advantages such as avoiding surgical procedures and its sequelae, treatment on outpatient basis, and reduction in an overall treatment time of 10–14 days as compared to 6–8 weeks when compared to that of external beam radiation treatment. This option is particularly useful for elderly patients and patients with poor performance status. Follow-up examination can detect a local recurrence at the earliest and surgical salvage can be carried out without much more complications as we can limit high-dose volume by brachytherapy. Even we can reserve external beam radiation as an option for second primaries of head and neck. The cost of HDR brachytherapy equipment is much lower than the cost of linear accelerators with intensity modulated radiotherapy or three-dimensional conformal radiotherapy and both the facilities were not available at MNJ Institute of Oncology and Regional Cancer Center during the study period. The mold materials used were the cheapest. Hence, this is a low-cost and effective therapy. The radiotherapy is equally effective in the treatment of early hard palate carcinomas. The HDR mold brachytherapy with custom-made applicators will be helpful in uniform dose distribution to the tumor with sharp fall of dosage at the edges of the applicators. Use of custom-made mold was reproducible for daily treatment and helpful for high-precision treatment, thereby achieving excellent local control, mucosal complications comparable to that of EBRT, less overall treatment duration, which can be carried out on outpatient department basis, and low cost as compared to conformal therapies. We would like to thank Dr. Subir Nag, Radiation Oncologist, formerly at Ohio State University, USA, for guiding us in doing the implant procedures; Dr. Jaya, Director, MNJ Institute of Oncology and Regional Cancer Center, Red Hills, Hyderabad, Telangana, India, for permitting us to use the data for publication; Mr. Jay, USA, for his constant help; and Dr. Sailaja Elchuri, Associate Professor, Sankar Netralaya, Chennai, Tamil Nadu, India, for helping us to publish this article. María Ángeles González Ruiz, Juan Quirós Rivero, Julia Luisa Muñoz García, Joaquín José Cabrera Rodríguez, Yesika Ríos Kavadoy, María Francisca Ropero Carmona, et al. High-dose-rate brachytherapy in the treatment of skin Kaposi sarcoma. J Contemp Brachytherapy 2017;9:561-7. Takacsi Nagy Z, Kásler M. Brachytherapy of head and neck cancer. Magy Onkol 2008;52:145-50. Guix B, Finestres F, Tello J-I, Palma C. Treatment of skin carcinomas of the face by HDR brachytherapy and custom made surface moulds. Int J Radiation Oncology Biol Phys 2000;47:95-102. Guix B, Guix JR. Treatmento de los carcinomas cutaneous de losparpados. Arch 1975;35:121-9. Daly NJ, Malissard L, Douchez J, Combes PF. [The use of disposable vascular catheters in interstitial brachytherapy of skin cancers (author’s transl)]. J Radiol Electrol Med Nucl 1978;59:361-4. Ashby MA, Pacella JA, de Groot R, Ainslie J. Use of A radon mould technique for skin cancer: results from the Peter Maccallum Cancer Institute (1975–1984). Br J Radiol 1989;62:608-12. Van der Laarse R. New implementation in VPS Version 10 and its differences from VPS Version 9.11. Nucletron manual. Veenendal, The Netherlands: Nucletron; 1991. Van der Laarse R, De Boer RW. Optimization of high dose rate brachytherapy. Activity: The Selectron User’s Newsletter 1989;2:14-5. Hideya YamazakI, Ken Yoshida, Yasuo Yoshioka, Kimishige Shimizutani, Souhei Furukawa, Masahiko Koizumi, et al. High dose rate brachytherapy for oral cancer. J Radiat Res 2013;54:1-17. Flynn A. Quality assurance checks on a microselectron HDR. 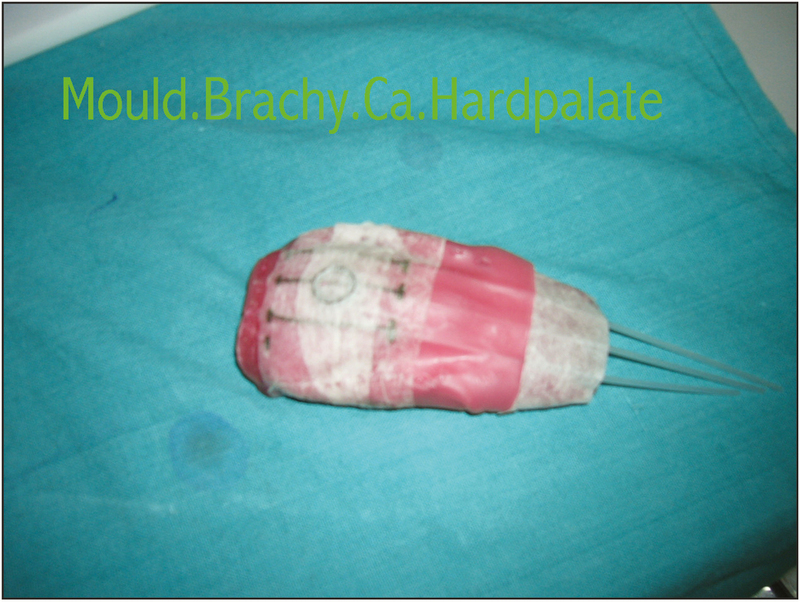 Brachytherapy J 1990;4:112-5. Chu A, Fletcher GH. Incidence and causes of failures to control by irradiation the primary lesions in squamous cell carcinomas of the anterior two-thirds of the tongue and floor of mouth. Am J Roentgenol Radium Ther Nucl Med 1973;117: 502-8. Mendelhall WM, VanCise WS, Hova IJ, Million RR. Analysis of time dose fractionation in squamous cell carcinoma of the oral tongue and floor of the mouth treated with radiation therapy alone. Int J Radiation Oncology Biol Phys 1981;7:1005-11. 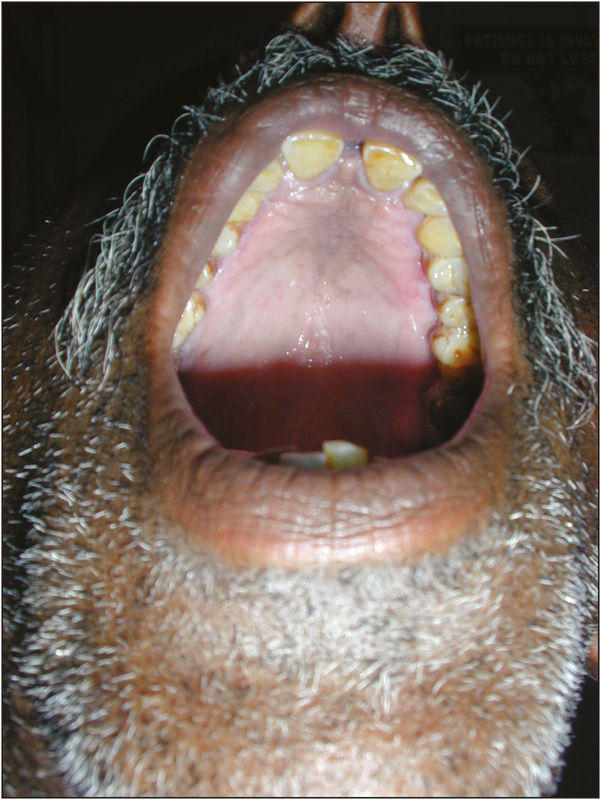 Fu KK, Lichter A, Galante M. Carcinoma of the floor of mouth: an analysis of treatment results and the sites and causes of failures. Int J Radiat Oncol Biol Phys 1976;1:829-37. Goffinet DR, Harrison LB. 192 iridium implantation of base of tongue carcinoma. Int J Radiat Oncol Biol Phys 1991;21:867. Harrison LB, Zelefsky MJ, Sessions RB, Fass DE, Armstrong JG, Pfister DG, et al. Base-of-tongue cancer treated with external beam irradiation plus brachytherapy: oncologic and functional outcome. Radiology 1992;184:267-70. Puthawala AA, Syed AM, Eads DL, Neblett D, Gillin L, Gates TC. Limited external irradiation and interstitial 192iridium implant in the treatment of squamous cell carcinoma of the tonsillar region. Int J Radiat Oncol Biol Phys 1985;11:1595-602. Puthawala AA, Syed AM, Eads DL, Gillin L, Gates TC. Limited external beam and interstitial 192iridium irradiation in the treatment of carcinoma of the base of the tongue: A ten year experience. Int J Radiat Oncol Biol Phys 1988;14:839-48. Dixit S, Baboo HA, Rakesh V, Bhavsar D. Interstitial and high dose rate (HDR) brachytherapy in head and neck cancers: preliminary results. J Brachytherapy Int 1997;13:363-70. Yu L, Vikram B, Chadha M et al. High dose rate interstitial brachytherapy in head and neck cancers. Endocuriether/Hypertherm Oncolob 1996;12:1-6. Nag S, Cano ER, Demanes DJ, Puthawala AA, Vikram B; American Brachytherapy Society. The American Brachytherapy Society recommendations for HDR brachytherapy for head-and-neck carcinoma. Int J Radiation Oncol Biol Phys 2001;50:1190-8. Halperin EC, Perez CA, Brady LW. Perez and Brady’s principles and practice of radiation oncology. 5th ed. London: Lippincott Williams & Wilkins (LWW); 2018.